As The Horse Trust welcomes a new resident, Qwerty, we say fond farewell to Poppy, who is returning to training before she will begin helping to police the busy streets of our capital. The Horse Trust works very closely with Mounted Police sections across the country and is the only UK charity that specialises in providing respite and retirement for police horses. Police horses may require respite for a number of reasons. Often older horses need a rest from everyday work in order to recuperate or recover from an injury. Some younger police horses also require respite in order to give them time to build stamina before returning to work or training. Poppy was four years old when she came to the Trust, and the Met Police felt it was in her best interests to have some time to rest and develop before continuing with police training. Police horses work hard to help protect our communities and, as well as routine patrols, they can also face terrifying situations and violence whilst controlling crowds during football matches, demonstrations and riots. This can be mentally and physically tiring for young horses. After ten months of respite, Poppy will return to training and, based on her kind temperament and character, it is expected she will become an exceptional police horse. As The Horse Trust bids a fond farewell to Poppy, Qwerty is welcomed. Four year old bay gelding Qwerty is an Irish Sport Horse and is 16.2hh. The Metropolitan Police think that he will benefit from a break at The Horse Trust to help him mature before returning to police work. Qwerty is very popular with everyone at the Met Police, who have already said they can’t wait to have him back! The Horse Trust is thrilled to welcome Qwerty to our Home of Rest. Jo Sullivan, horse trainer at the Met Police said ‘We are delighted to have Poppy back and I’m sure she will enjoy a return to her training. Qwerty has completed his police training, so after a few months of rest to give him some time to mature, he will re-join the Met and begin working. I’m sure he will enjoy his time at The Horse Trust and will settle in very quickly’. The welfare of horses is hugely important to both the Met Police and The Horse Trust and the two organisations have a strong relationship. 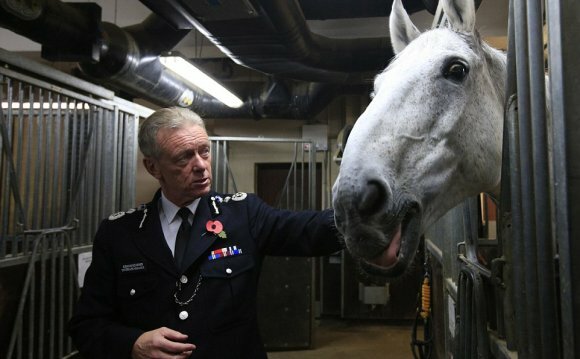 The Horse Trust considers it an honour to provide respite and retirement for the hardworking horses of the Met Police. Jeanette Allen, Chief Executive of The Horse Trust said ‘The Horse Trust has a long history of providing respite for working horses, dating back to 1886 when our Home of Rest for Horses was founded. In the 21st century we are privileged to continue this essential work. Although we are all sad to say goodbye to Poppy who has become a very special character here, we are looking forward to welcoming Qwerty, our new arrival’. Providing respite and retirement for working horses is a core part of The Horse Trust’s work. The Horse Trust is delighted to welcome Qwerty who will be welcome to stay for as long as he needs to, until he is ready to join Poppy and all of the horses of the Metropolitan Police Mounted Section. The Metropolitan Police Mounted Branch is a Central Operations branch of London's Metropolitan Police Service. The responsibility of the branch is to conduct safe policing of football matches, and crowd control at other large public order events.